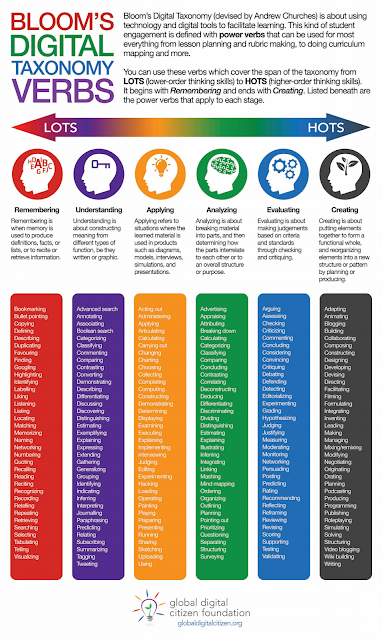 Bloom’s Digital Taxonomy Verbs | Learn. Create. Share. Bloom’s Taxonomy is commonly used as a framework to structure lessons, activities, and assessments. The model provides a continuum from lower-order thinking skills (LOTS) to higher-order thinking skills (HOTS). As with any teaching tool, we have to consider how technology is being used to support learning. There is nothing wrong with students using their devices to search, read, and highlight information. We should, however, challenge our students to demonstrate learning using domains which require higher-order thinking skills. The Global Digital Citizen Foundation created the following infographic to classify “power verbs” within each domain. Reference the diagram when lesson planning and integrating technology to facilitate learning. Click the infographic below to download a PDF copy.